This particular day started the night before! Having arrived in the Isle of Skye during the weekend with total cloud cover, I was looking for the first opportunity to get out with the camera for a good sunrise session. The previous year when we visited the north west Highlands of Scotland for two weeks, the weather hadn't permitted any sunrise excursions (where the sun would be seen!). 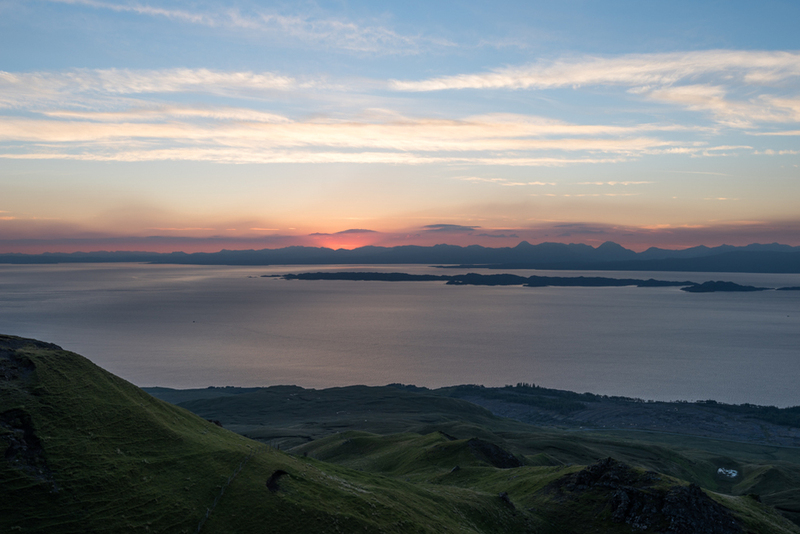 So when I checked my weather apps the night before and saw that the next morning was going to be clear, I decided that the 3.00am alarm would be worth it to head off to the Old Man of Storr before dawn in order to get photos at sunrise. Getting up that time of the day (or rather night!) was a real struggle, but bleary eyed I drove down to the parking location at the bottom of the The Storr, and headed off up the track, laden with camera gear and tripod (I can definitely recommend that level of exertion in the early morning for waking you up and getting the heart rate going!). As I ascended the rough, rock strewn path, I looked across at the first light of day and knew that it was going to be a good one. I found it surprisingly tiring as I continued up the path, struggling at points to work out where the track went in the dark, and at one stage staring at a rock that I had to step up over, summoning the mental will and energy to carry on! So much for all my 5-7 mile runs in recent months, they didn't seem to help at that particular moment! However once I had reached the viewpoint where I was going to take the photos, the memory of the tiredness faded away! Even in the pastel light of the blue hour the view was stunning - the photo hiding the fact of the gale force winds that battered the tripod! But I wasn't the only one who had made the early morning trip. I first met Riccardo (@riccardozambelloni), a great guy who combined his love of hiking with photography. There were also two North Face tents pitched on the top of this windy high point - I was later to discover that Chris Burkard (@chrisburkard) and some friends who were up in the location for photo shoots were sleeping there overnight and joined the line of us watching the day dawn. Only later did I discover the legend of a photographer that Chris Burkard is. It doesn't matter how many post cards are seen, how many photos in the books are viewed, there is nothing quite like 'being there' when this sort of moment arrives and just taking in the view, the colours and the beauty of creation. The light was amazing and showed the Old Man of Storr in all its glory. Soon it was time to head back down, thankful for the day, the strength to make the trip and catching a few more photos on the way down!